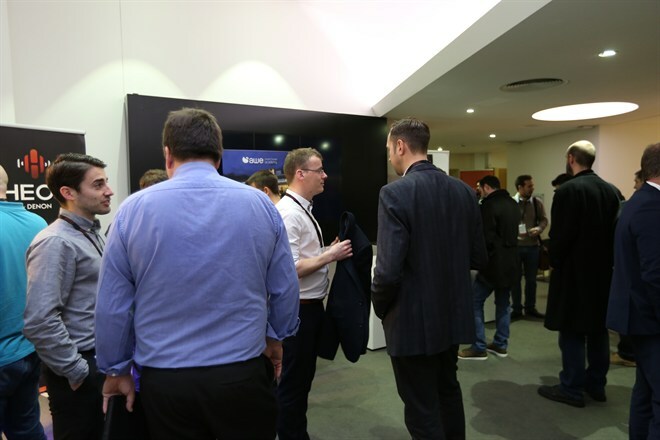 CEDIA Tech Forum 2015, held at The British Library Conference Centre in London, provided a great opportunity to network and see the latest products from exhibitors’ stands. But the best part of the event was the technology training sessions. WyreStorm showcased many of the products that it launched successfully at the CEDIA Dallas event in October, including its SW-0402-MV-HDMI. The 4-input (12 Source) dual-output picture-in-picture (PiP) multi-view 4K scaler can display up to four HD/SD video sources at once on a 4K screen. The switcher is ideal for business applications requiring multiple sources in one or two screens, such as video conferencing, security control rooms or hospital monitoring. However, the application that most people though of, when thinking of 4 HD video sources on one screen, was sports – you could watch four games at once! The Austrian manufacturer of green coloured mini server boxes, Loxone, urged the audience to shift their discussion with customers from talking about technology to instead highlighting solutions and benefits of smart technologies for the home. “Ecosystems that can learn the working of a home, and manage smart energy for heating, lighting and security in a simple and straightforward way, and that are independent of the house owner acting upon an alert or remembering to change some settings remotely, are the future. It would be like hiring a manger to cleverly regulate the functioning of your home and you won’t even need to think about it,” concluded Schuster. The cost of outfitting a home with a Loxone mini server ecosystem solution would equal to around one or two percent of the value of the property. You might think that to perceive HD video you need your eyes and for HD audio you need a good pair of ears. Well, Meridian Audio’s director of sales, Barry Sheldrick, said that studies have shown that people wearing glasses have a reduced perception of HD audio. Matt Holland, the company’s Business Relationship Manager went on to explain that audio resolution is measured taking into account: loudness, noise, range of the frequencies, pitch accuracy and timing accuracy. Ideally one would look for naturalness of the sound, as if coming straight from the microphone, the sound of the real world. But these are characteristics of analogue sound. The digitisation of sound has lead to ‘lossy compressions’ where partial data that is considered ‘not essential,’ is sacrificed and omitted to reduce the data size and therefore make it easier to stream. Bob Stuart, Meridian’s co-founder, invented Meridian Lossless Packing (MLP) algorithm, recognising the potential of CDs and DVDs to provide high resolution multichannel audio. MLP is the standard lossless compression method for DVD-Audio content today, however, not all speakers can play HD audio. To give HD audio the seal of approval, Meridian is introducing its Meridian HD branding logo. 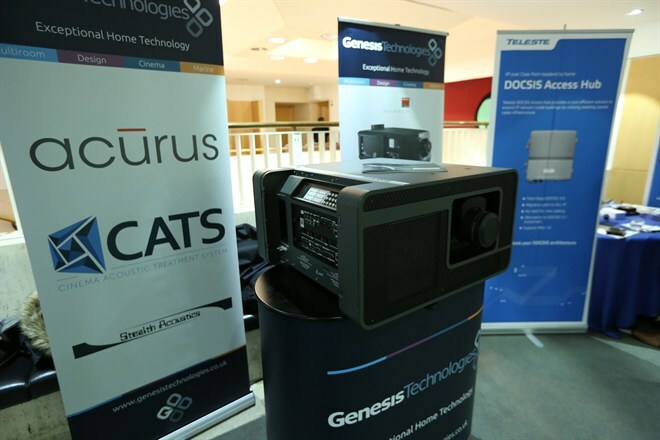 The company also showcased its Meridian Sooloos multi-room streaming platform. With its easy user interface, Sooloos allows users to mange and find the files they have, including photos, movies and of course music. 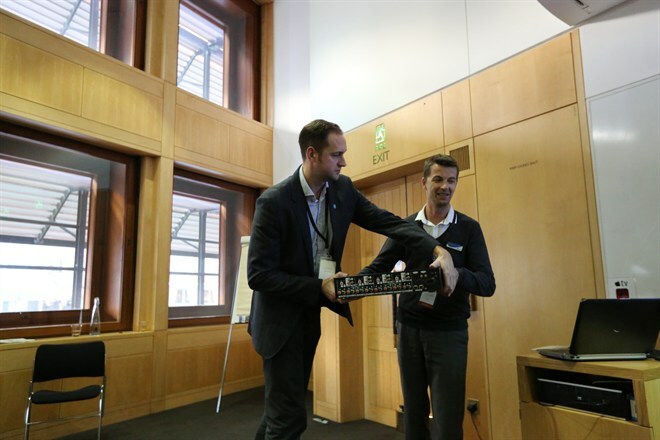 AWE’s installer’s guide to multi-room and home cinema solutions was instructive and highly entertaining – especially when chocolate started flying around the room to reward diligent students that answered James Drummie’s questions. Drummie heads many of the training courses that Awe provides for installers at its award winning ‘SmartHomeAcademy.’ His skills as a teacher and a ‘Home Cinema Wizard’ – as he describes himself on LinekdIn, were apparent when by the end of the session we were all screaming out loud the answers to the quiz questions in search of an approving nod – and a chocolate. 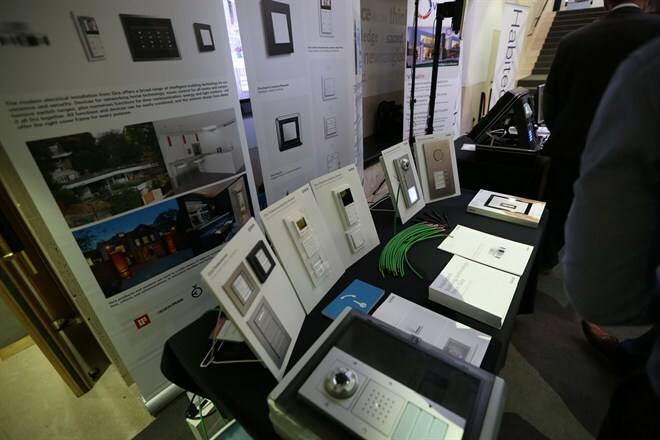 Stuart Tickle talked about the company’s trajectory on its 80th anniversary and the new head quarters where they have built a show apartment to show installers and clients how the technology works together. Awe has key partnerships with companies such as Epson, Samsung, Panasonic and Loewe. The room can be scaled up or down to show the different options, depending on the budget. AWE’s presentation didn’t limit itself to photos on the screen. We all had a chance to take a closer look at the speakers as they were passed around the rows. Some, such as the battery powered HEOS 1 speaker, was neat and compact, ideal to have anywhere around the home, since it’s water resistant and has Bluetooth connectivity. Others, like the KEF Ci160QR ceiling speakers or the KEF Ci4100QL in wall speakers, were very heavy and robust. This Christmas I can impress my friends telling them what is the exact angle they need to get their ear level, ceiling or floor level subwoofer speakers. I can even tell them that if they want to hear ‘the voice of God’ (or 3D audio), they’ll need an Auro 3D system installed.